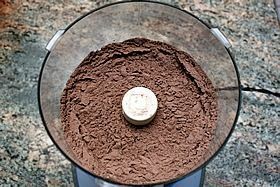 I use my 14-cup food processor almost daily to simplify tasks like quickly blending this Hot Cocoa Mix. 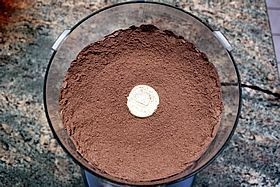 If you don't have a food processor, a whisk will work for mixing the Hot Cocoa Mix. These are easy to fill and a great size for storage and gift jars. This funnel makes filling jars fast, easy, and tidy. These feed into both Laser and Ink-Jet printers for making your own labels. 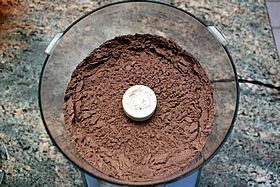 This adds creaminess to the dry cocoa mix. Dutch-process cocoa is a darker, richer color and has less acidity than natural cocoa giving it a smoother, mellow taste. These melt into the mix, adding another layer of smooth richness to the cocoa. 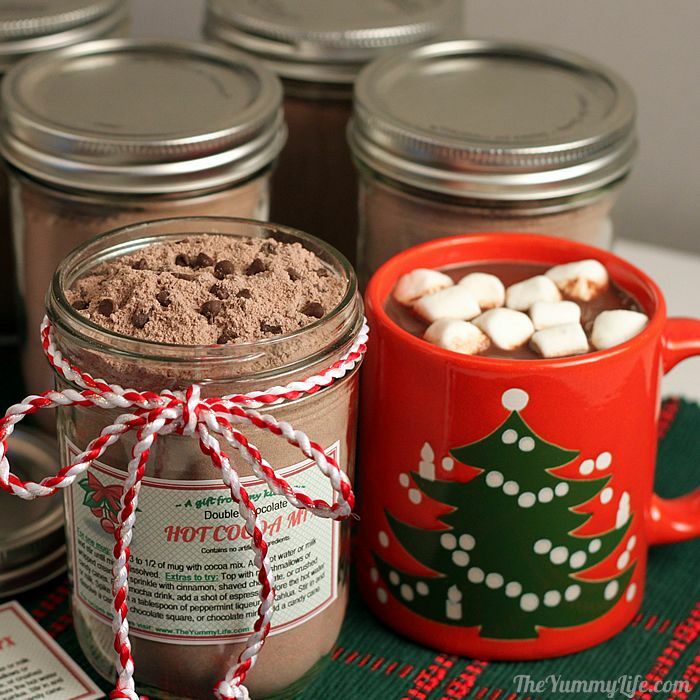 An easy mix for instant rich hot chocolate. 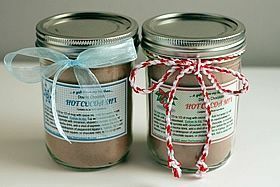 Printable tags for gift jars. 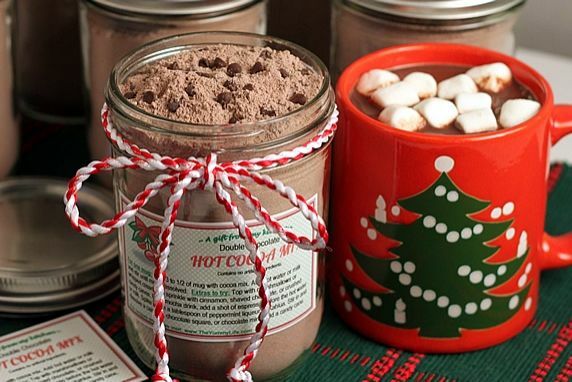 This mix makes a rich, chocolaty mug of hot chocolate. It's convenient to have on hand during cold weather, and also makes a great gift. 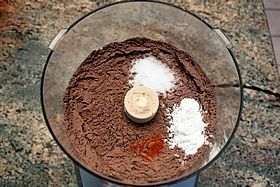 Add sugar and cocoa to food processor. Pulse until well-mixed. (Or, combine ingredients in large bowl and whisk until well mixed.) Add salt, cornstarch, and cayenne; pulse until mixed. 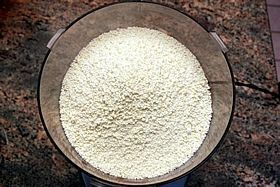 Add powdered milk; process for 20-30 seconds until well mixed. 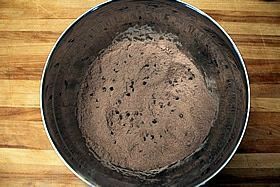 Transfer mix to bowl and stir in chocolate chips. Store in airtight container. Fill 1/3 to 1/2 of mug with cocoa mix. Add hot water or milk and stir until mix is dissolved. 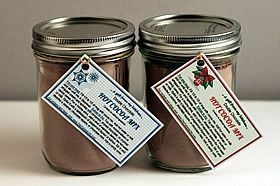 --Top with marshmallows or whipped cream and sprinkle with cinnamon, shaved chocolate, or crushed candy canes. --For a mocha drink, add a shot of espresso before the hot water or milk. 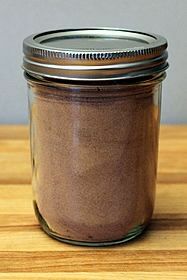 --For spiced cocoa, add 1/4 teaspoon pumpkin pie spice to mug. --Spike it with a tablespoon of peppermint liqueur or Kahlua. 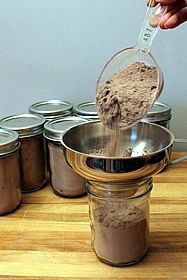 --Stir in and dissolve a caramel, chocolate square, or chocolate mint. 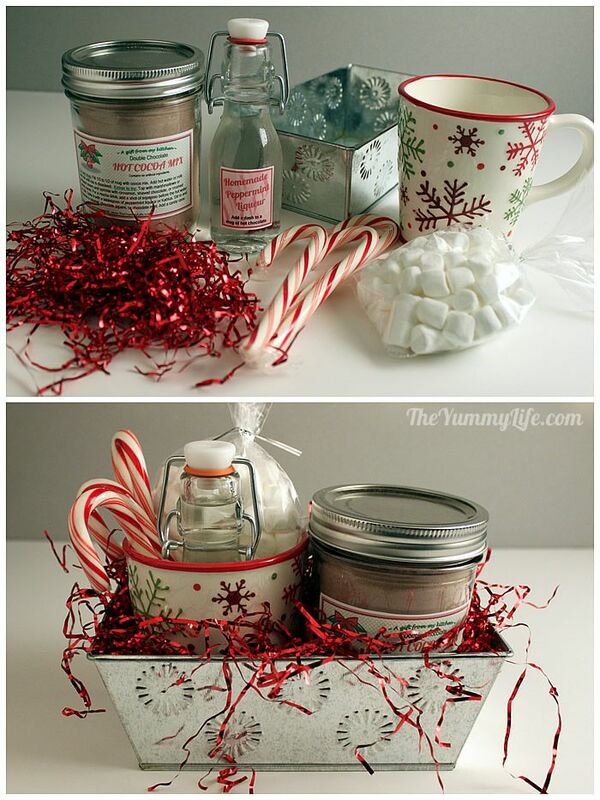 --Add a cinnamon stick or candy cane for a stir stick. Hot cocoa is comfort on a cold day. I like mine dark, rich, and chocolaty. This mix is all that. It's so easy to make a quick batch to have on hand during the winter months. And, this always makes a popular gift. 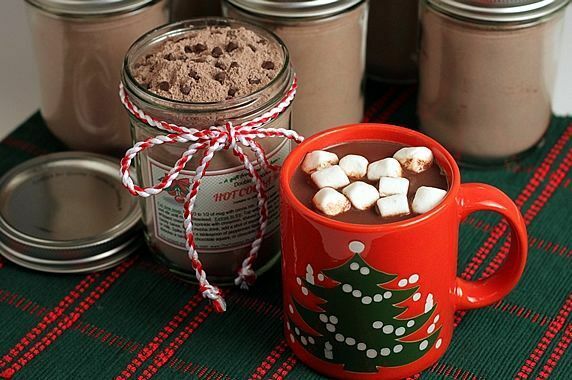 It's hard to find someone who doesn't like hot cocoa. You'll find downloadable tags below, to make it easy for you to turn this into a gift jar. 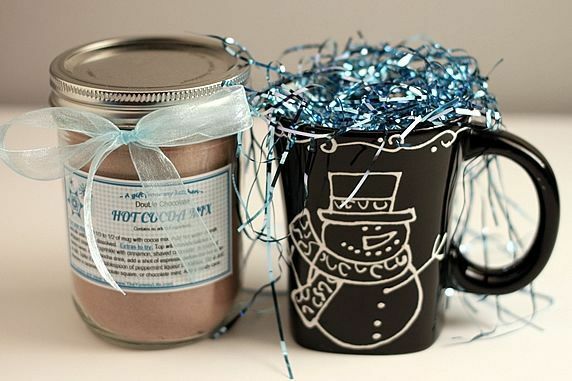 Many hot cocoa mix recipes use an artificial coffee creamer to add creaminess to the mix. I prefer to leave out artificial ingredients and eliminate that hint of a chemical taste. This recipe, based on Alton Brown's, has pure, wholesome ingredients. It has powdered milk in it, so it's intended to be mixed with hot water. But I like to add more creaminess by doubling up on the milk--I like mine mixed with hot milk. Hot water is good, too. Your choice. 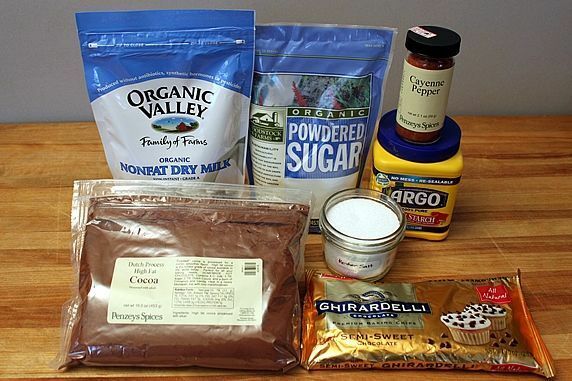 My recipe is DOUBLE chocolate, because I add mini chocolate chips along with the cocoa powder. Why? Because I can. And, my philosophy is that more chocolate is always better. The chips melt into the hot cocoa and add a layer of richness that sends me straight to chocolate heaven. I recommend that you use the best quality cocoa you can find. That's the key to a good cup of hot cocoa. I prefer Dutch-process cocoa, if it's available where you shop. My favorite is Penzey's. If they don't have a store in your area, you can order it online. But, there are more common brands available at the grocery store that will do just fine. Amazon has a good organic Dutch-process cocoa. Did you know? Dutch-process cocoa is a darker, richer color and has less acidity than natural cocoa giving it a smoother, mellow taste. If you have a food processor, it makes the mixing easy and thorough. But you can also whisk everything together in a big bowl. First add the powdered sugar and cocoa to the food processor. Pulse until mixed. Add the cornstarch, salt, and pinch of cayenne. Pulse until mixed. Add the powdered milk. Process for 20-30 seconds until well mixed. 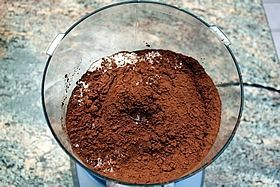 The food processor does a great job of pulverizing the dried milk and giving the cocoa mix a fine, consistent texture throughout. 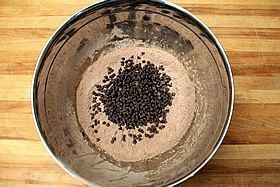 Transfer the mix to a large bowl, add the chocolate chips, and stir. Put the mix in air tight containers. I used pint size, wide mouth jars. One batch fills 3 of these jars. A canning funnel makes this task tidier and easier. 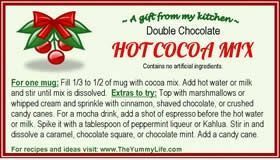 It's easy to turn this cocoa mix into a gift! 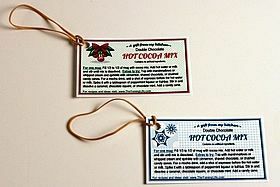 With the tags I provide below and some ribbon, you've got a quick, homemade gift that is sure to please. Perfect for teachers, neighbors, and co-workers. This is also a great gift for college students--something I always made for our boys to have in their college dorms. Back in the day. Downloadable tags. Here are 4 downloadable gift tags to choose from. 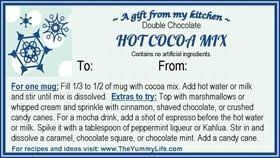 They include instructions for using the cocoa mix. Just click on the image to print a sheet of the tag(s) of your choice. You can print them on sticker paper and stick them on the jar. Or, print them on paper or card stock and tape or tie them on. 2. Red & Green Christmas tag with place to write "To and From"
4. Blue winter tag with place to write "To and From"
These tags were printed on sticker paper. It's easy to cut them out and stick them right on the jar. That way the mixing instructions are attached and handy. Add a bow if you like to pretty it up. Or, print the tags on card stock, punch a whole in the corner and tie on a rubberband. These can easily be stretched around the jar rim where they can stay for easy reference. Kick the gift up a notch by including a fun mug. 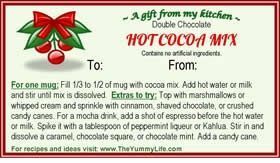 Add a bottle of my homemade peppermint liqueur to a mug along with some candy canes and marshmallows for an extra fun gift. I made up a dozen of these gift combos to give to King-Mans co-workers last year, and they were a hit! 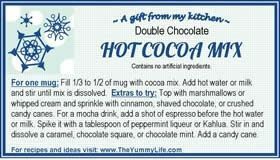 Don't forget to save some of the mix so you can make a delicious, chocolaty mug of double chocolate hot cocoa for YOU! Top with marshmallows or whipped cream and sprinkle with cinnamon, shaved chocolate, or crushed candy canes. For a mocha drink, add a shot of espresso before the hot water or milk. 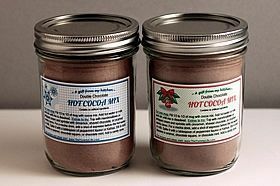 For spiced cocoa, add 1/4 teaspoon pumpkin pie spice to mug. Stir in and dissolve a caramel, chocolate square, or chocolate mint. Add a cinnamon stick or candy cane for a stir stick. This post was updated 11/2013.